Description: (obverse) Britannia seated on a globe, holding a laurel wreath over the British lion and holding a palm branch in her left hand while resting on a shield embellished with the Union Jack. (reverse) wreath of laurel and oak leaves. 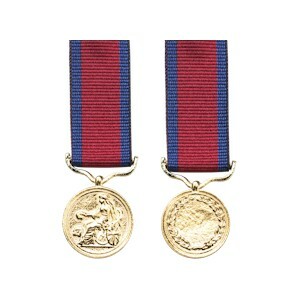 Comments: Instituted in 1810 these medals were struck in two sizes. Large medals were awarded to generals and the smaller to officers of field rank for actions during the Peninsular War 1806-14 and War of 1812.